Evergeen destination for those chosing to start the new year in a magical atmosphere, New York City is the best possible location to welcome 2014. Toasting in Times Square, perhaps, assieme together with thousand others, or in Central Park or on top of Lady Liberty. There are many opportunities in the city that never sleeps. While waiting for the midnight, why not pass some time at the Rockfeller centra ice skating rink? The beautiful rink is set up every year on the Fifth Avenue. Be warned, very long cues await you and tickets are pretty expensive ($35 for half and hour skating) but this is a must stopover if you are in New York for the New Year. New York is famous for its nightlife so why not have a nice dinner in the warmth rather than await the midnight in the cold streets. There are plenty of places around Times Square, some at reasonable prices,where you can spend a pleasant few hours also accompanied by good music. Amongst them, the Dizzy’s Club – Jazz at Lincoln Center stands out for its quality: the Dizzy;s is considered the temple of jazz music. Located in the heart of Manhattan, this club will offer an unforgettable experience, even if it may dry up your resources a little, it would still be worth it. 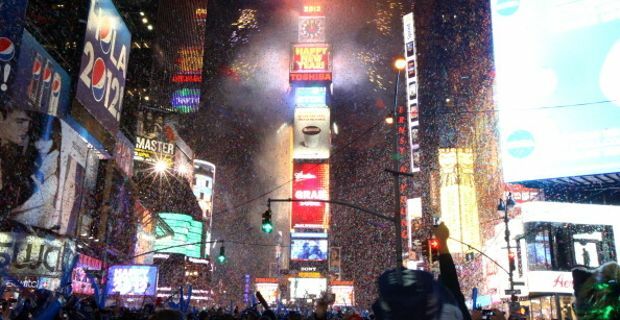 Of course, New Year's Eve in New York City means Times Square. Best loved location for the New Year celebrations, come here and enjoy the mass countdown under the clokc, or admire the Waterford Crystal Ball, famous crystal ball placed on top of One Times Square, the skyscraper in the middle of the square. Then greet the new year in the midst of the amazing display of fireworks and thousands of streamers. Make sure you get there early though: Times Square start filling up already in the early afternoon. And remember, alcohol is prohibited in the streets, so resort to toasting with non-alcoholic fizzy drinks.